Puzzle games are the most played game types on mobile phones. They are fun and easy to get a hold of, as well as giving the player tons of continuous fun challenges. One such game is Aliens Eat Cats, which we will be talking about today. The game is free to download and play for all Android users. Aliens Eat Cats has a very unique gameplay. You control three aliens, which all move at the same time. They also don’t move one step at a time, but instead move from one corner of the map to the other. There are also obstacles that appear on random tiles on the map, so you have to get them stuck in advantageous positions in order for one of them to reach the cat and eat it. This is important as there is a timer on the map, and each time your aliens eat a cat the timer gets increased. 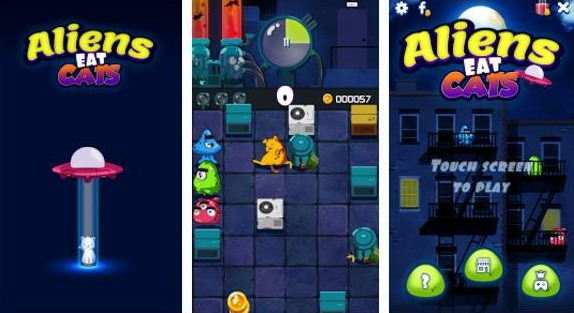 The game also features upgrades and skill ups for your aliens, funny graphics and even funnier sounds. We highly recommend it for both casual and competitive puzzle players. If you’re interested, you can find and download the game on Google Play.